This is my first fish ever! I was inspired by the work of Kim T. Stewart and decided to do a fish too (although mine is no where near as cool as hers). Very Interesting Details as Your work is always Exceptional and Very Worthy of praise. 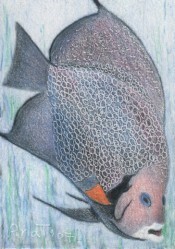 Splendid colored pencil, Ana! Wonderful technique! This piece is incredible...You are really great.